Melvyn Bragg and his guests discuss the contents and influence of the Bhagavad Gita, one of the most revered texts of Hinduism. 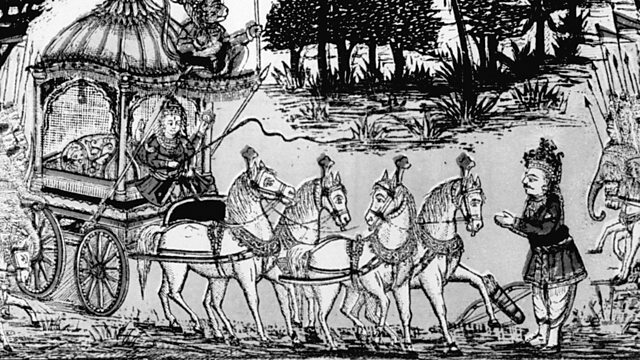 Melvyn Bragg and his guests discuss the Bhagavad Gita.The Bhagavad Gita, a 700-verse section of the Sanskrit epic the Mahabharata, is one of the most revered texts of Hinduism. Written in around 200 BC, it narrates a conversation between Krishna, an incarnation of the deity, and the Pandava prince Arjuna. It has been described as a concise summary of Hindu theology, a short work which offers advice on how to live one's life.The Gita is also a philosophical work of great richness and influence. First translated into English in the 18th century, it was quickly taken up in the West. Its many admirers have included Mahatma Gandhi, whose passion for the work is one reason that the Bhagavad Gita became a key text for followers of the Indian Independence movement in the first half of the twentieth century.With:Chakravarthi Ram-PrasadProfessor of Comparative Religion and Philosophy at Lancaster UniversityJulius LipnerProfessor of Hinduism and the Comparative Study of Religion and Fellow of Clare Hall at the University of CambridgeJessica FrazierResearch Fellow at the Oxford Centre for Hindu Studies and Lecturer in Religious Studies at Regent's College, LondonProducer: Thomas Morris.